In the Philippines, Maundy Thursday and Good Friday are considered as national non-working holidays. It is a time when Catholic Filipinos commemorate the life and death of Jesus Christ and abstain from doing a lot of worldly things. 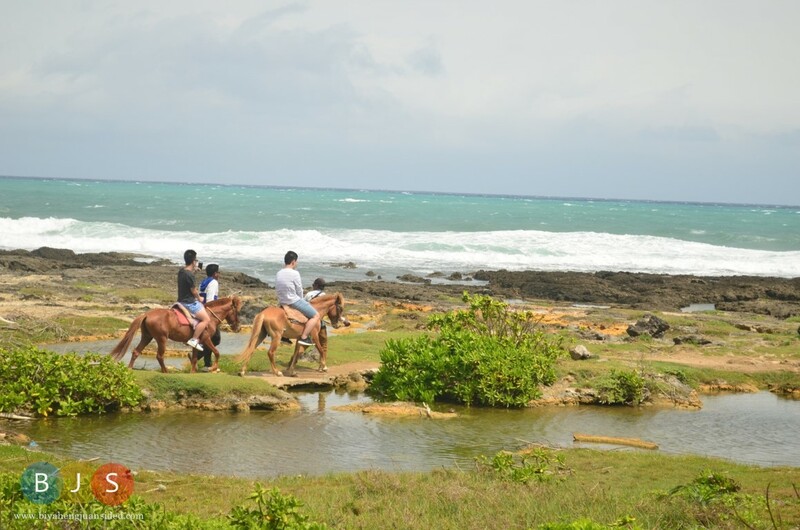 But for most, it is a time when they take mini vacations, and visit different places. This one is true for me. 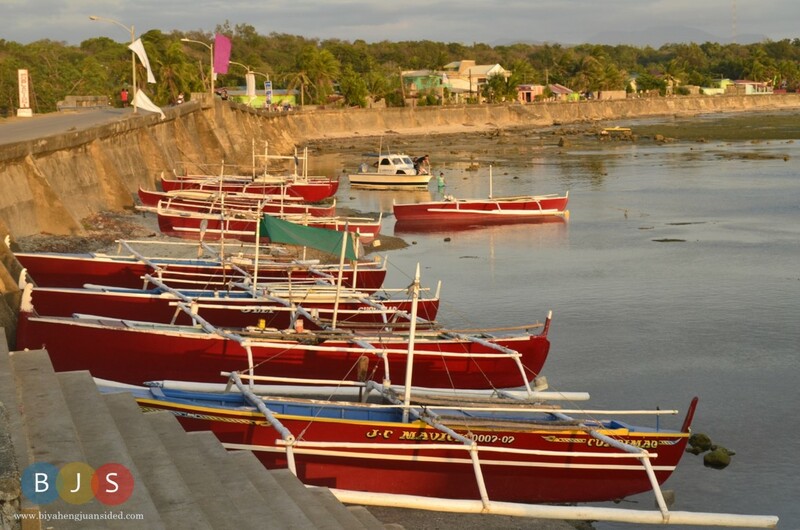 This year, I decided to spend the holy week in Ilocos Sur and Norte, where 2 of my churcmates live. 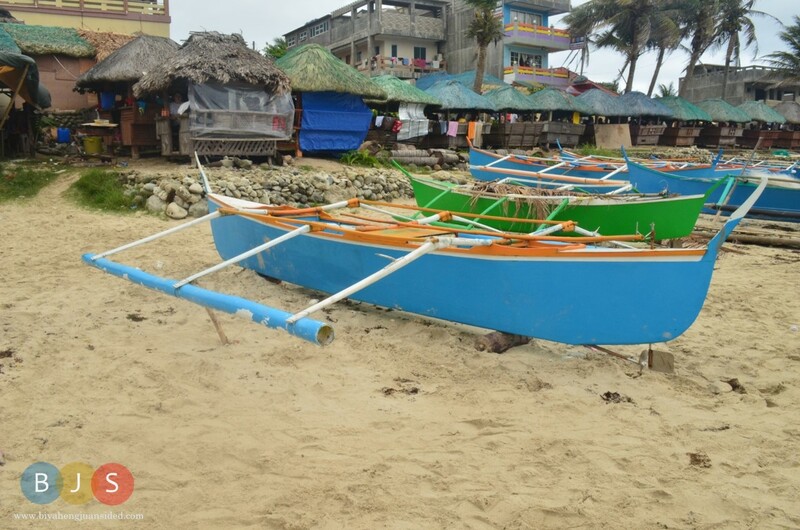 This was not my first time to visit these provinces, however, during my first trip, I did not really have an opportunity to visit a lot of places since the trip was work-related. 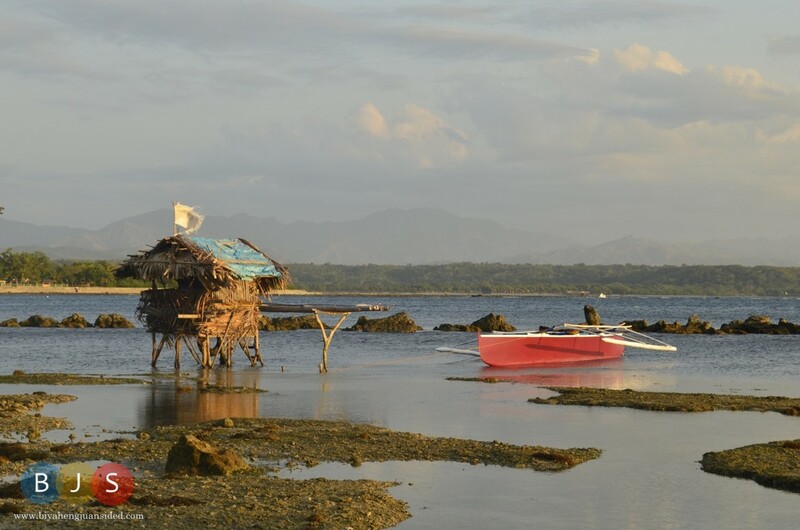 Since I first stayed in a friend’s house in Batac, this was our first stop. 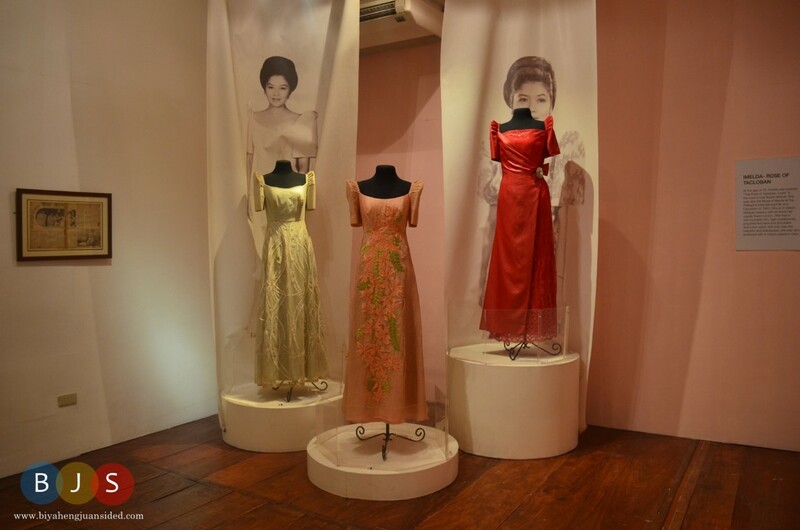 Marcos Museum houses a lot of collection about the life of Former President Ferdinand Marcos and his family. The location of the museum is very accessible, as it is just along the national road. From the townproper , you may opt to ride a trike or even just walk. We stayed here for just 30 minutes, including the visit to the mausoleum. 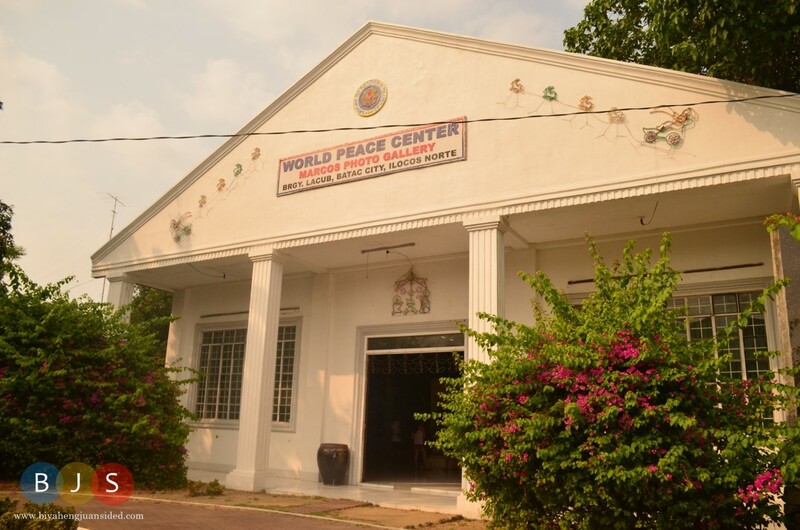 Few walks away from Marcos Museum is the World Peace Center or the Marcos Photo Gallery. 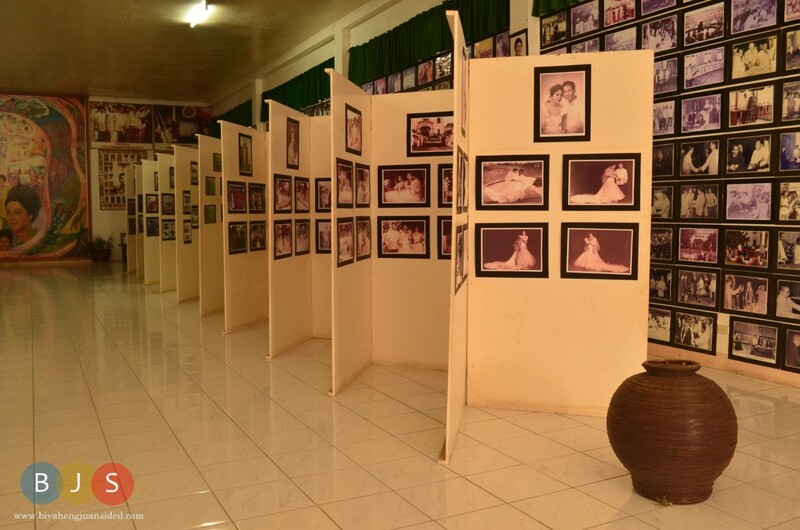 The name of the gallery itself will tell you what to expect: a gallery filled with photos of Former President Marcos, his younger days upto his days being the president. 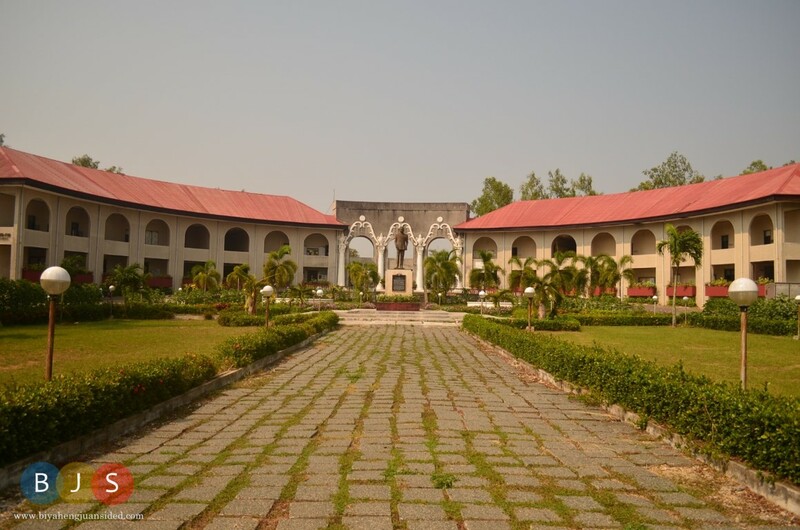 Another stop over that we had during our stay in Batac was in MMSU. 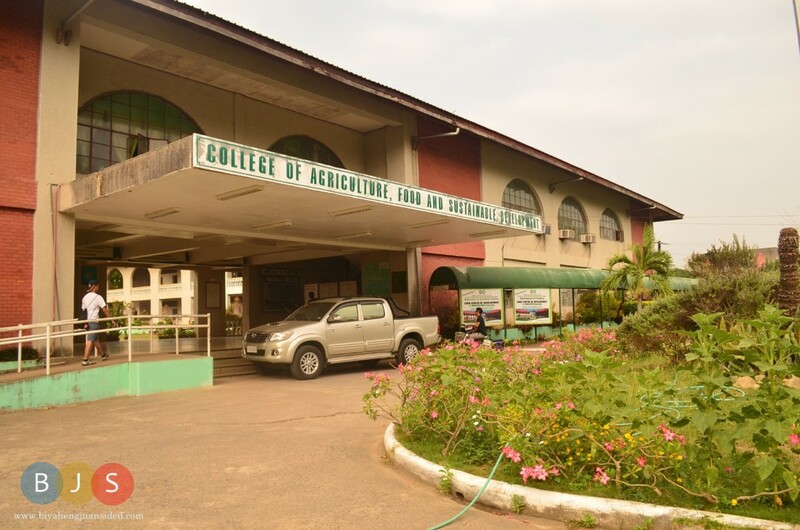 The Batac campus was vast and everywhere you look, you could see a wide range of floral species. 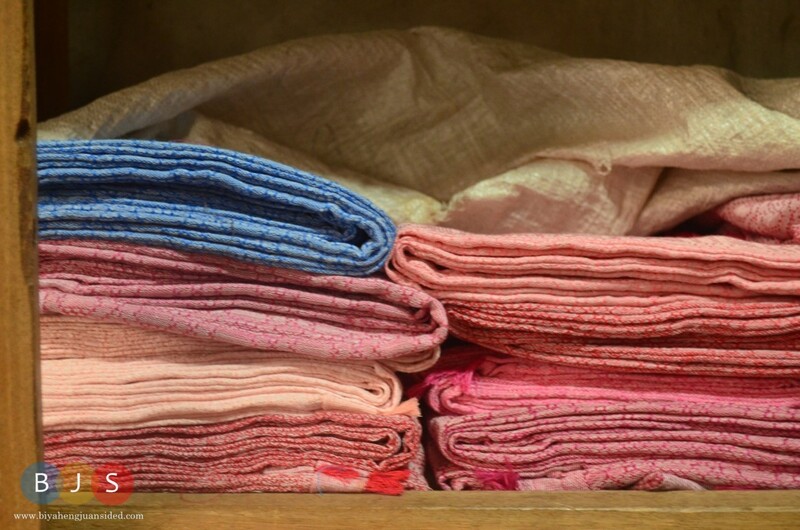 from fruit-bearing trees, vegetables crops, and to the beautiful ornamental plants. If you have time, you may also pay MMSU a visit, especially if you love visiting state universities. 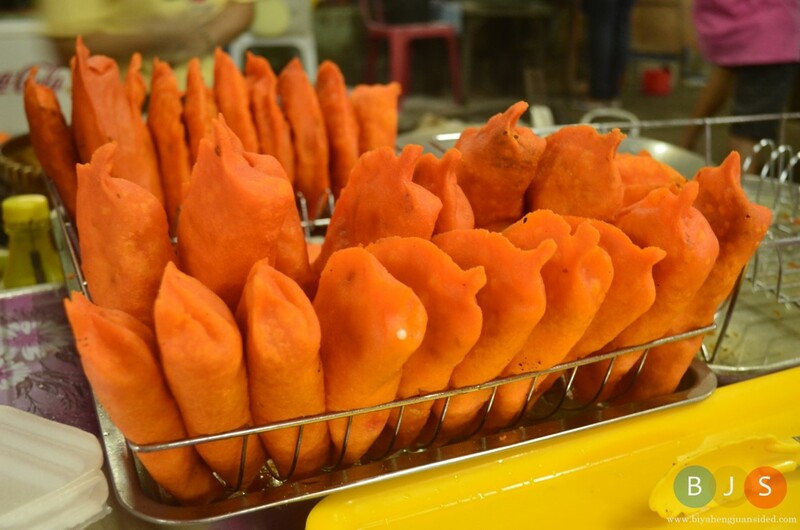 For those who are longing for a nice treat, one of the best (and cheapest) pride of Ilocos is its Empanada. According to my friend, the best empanada can be bought in Batac, where Empanada Festival is being held annually every June. 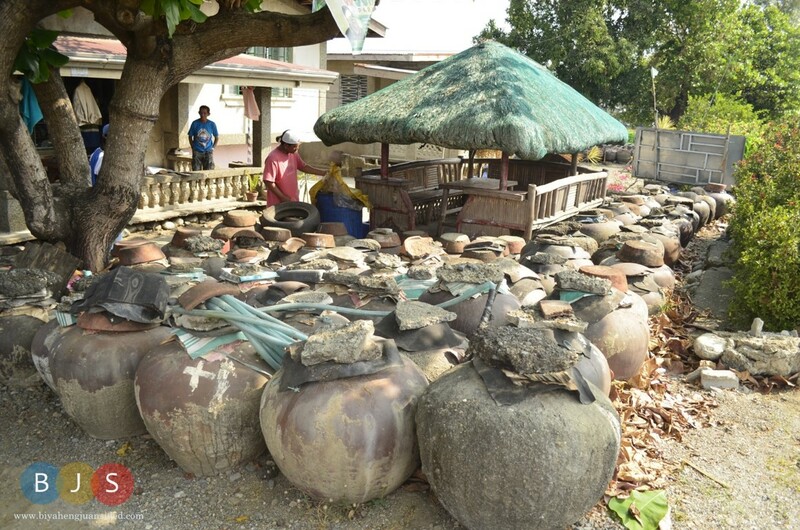 Located near the Marcos Museum, you can visit the Batac Riverside Empandahan where a long line of shops selling the mouthwatering empanda. 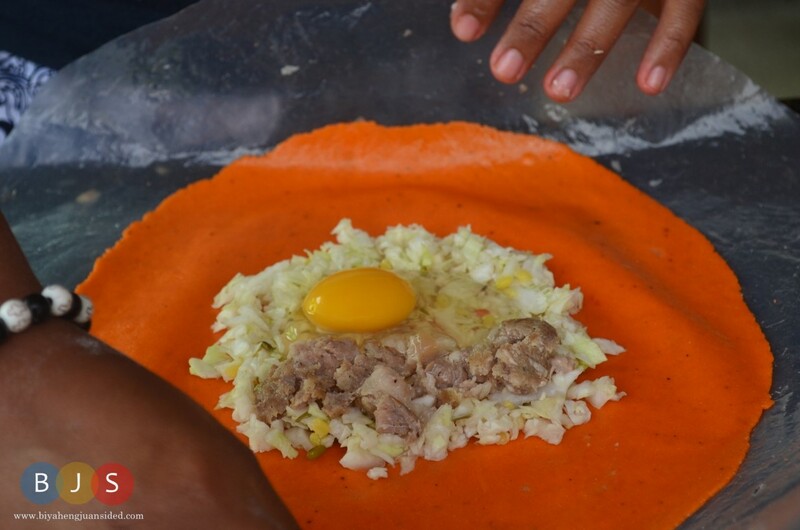 The special empanada, which we ate numerous time during this trip, has an additional special ingredient, which is the Ilocos longganisa, another delicacy in the region. 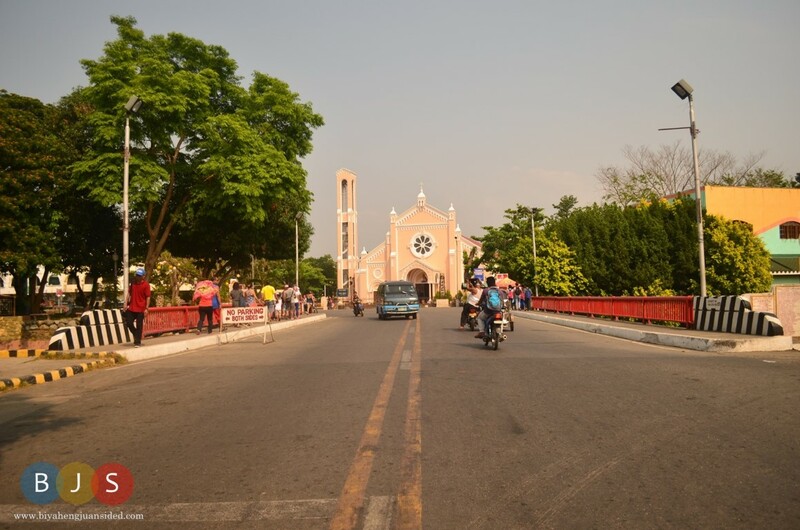 One of the most famous tourist area in the region is Paoay Church. The church, which is also called as St. Augustine Church, was built in the late 1600 and was completed in the latter years of 1800. As you may notice, the belfry of the church is detached from the church. Furthermore, the lateral design of the church was also different from the usual designs of the other Catholic churches in the country. The overall design of the church, and the detachment of its belfry, is a precaustionary measure in case an earthquake hit the area. 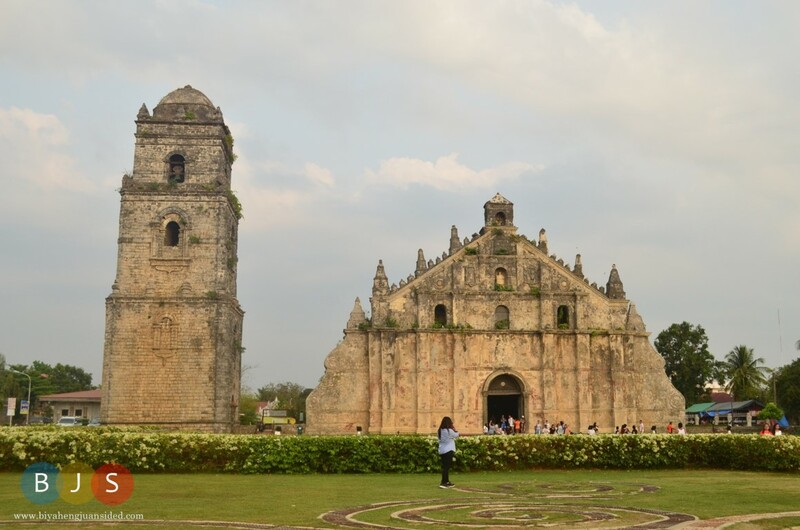 Paoay Church is also among the World Heritage Sites, as declared by UNESCO. According to UNESCO, as indicated in the metal plate in the church, it is because, ” The Church of San Agustin possesses exceptional universal value that deserves protection for the benefit of all humanity”. 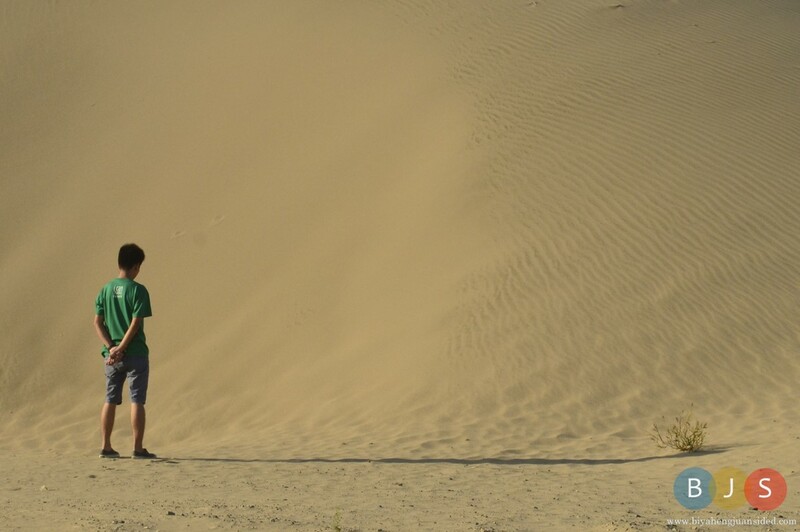 There are many sand dunes in Ilocos Norte, especially in the municipality of Paoay. 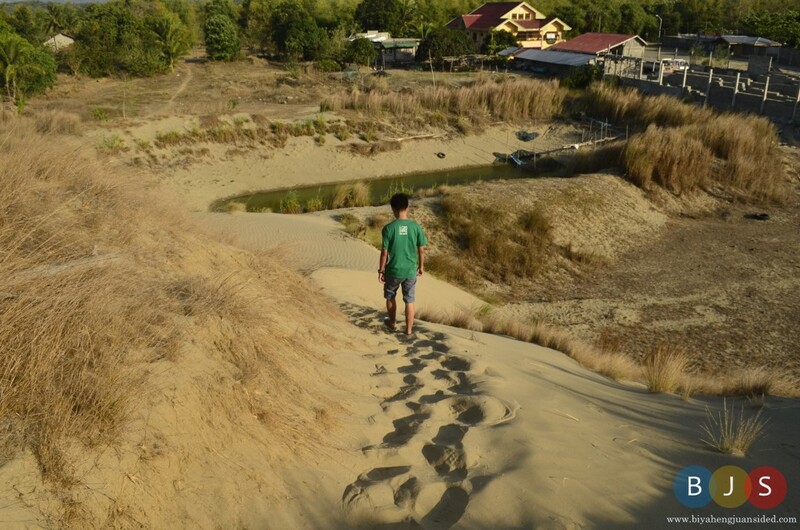 The sand dune in the photo is located just along the national road, which was basically not yet developed for any tourism-related activities. So when we stopped by the area, we just went uphill for a while and took some photos. 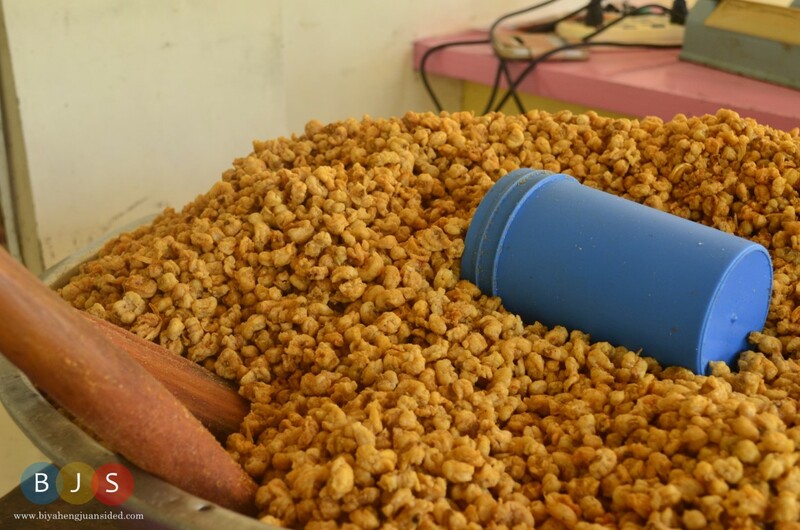 Of course, you should not also forget to bring home Paoay’s famous chichacorn (crispy corn snack). A lot of shops are selling them around the region, especially near Paoay Church. During my trip, my friend’s family took me to the production shop of chichacorn where I got the chance to look at how chichacorn are being produced. This is another reminder that the country was once ruled by someone from the north. 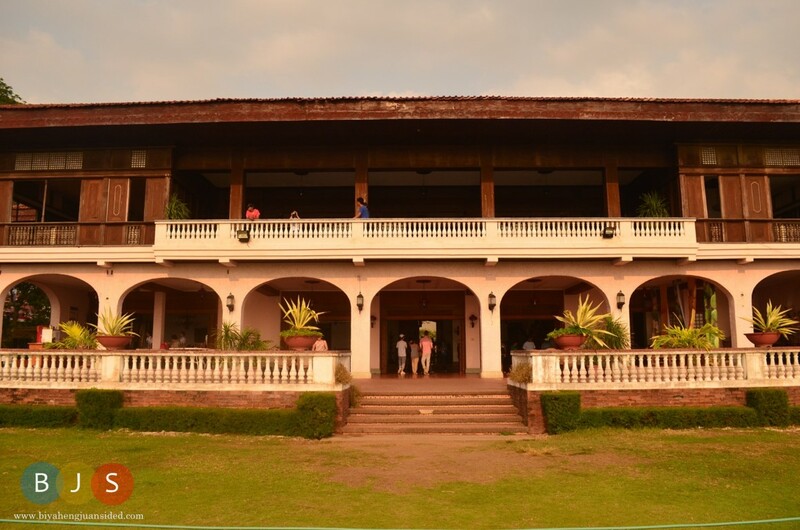 The mansion, as we now called Malacañang of the North, was used to be the home of the Former President Ferdinand Marcos, the Philippines’ longest ruling president. 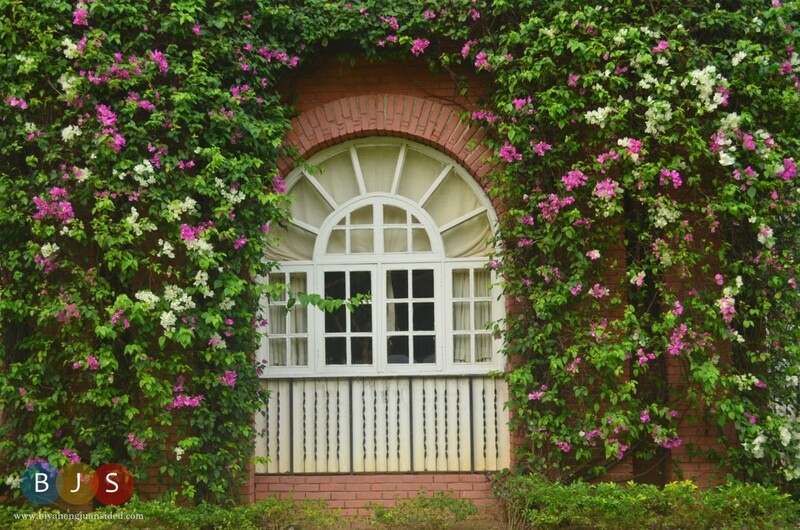 The mansion is still well-maintained, and therefore, it was able to preserve its grandeur and extravagance. 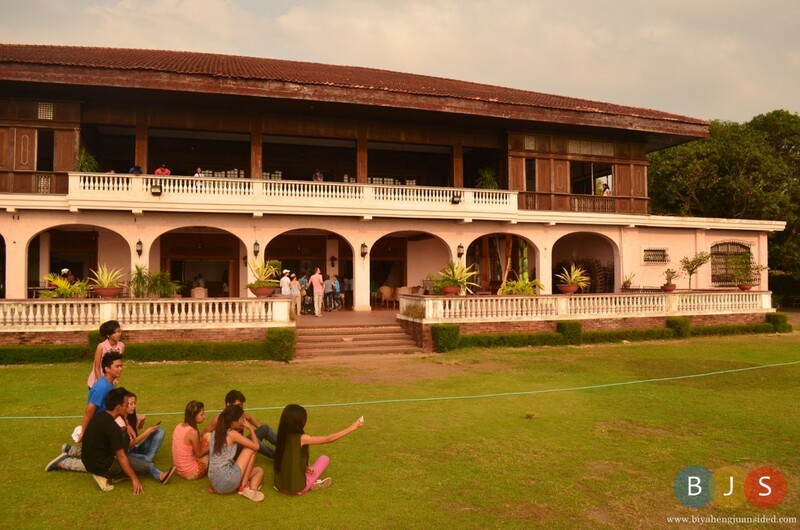 Tourists can enjoy taking a lot of photos inside and even outside of the mansion, as it offers a great view of Paoay Lake. 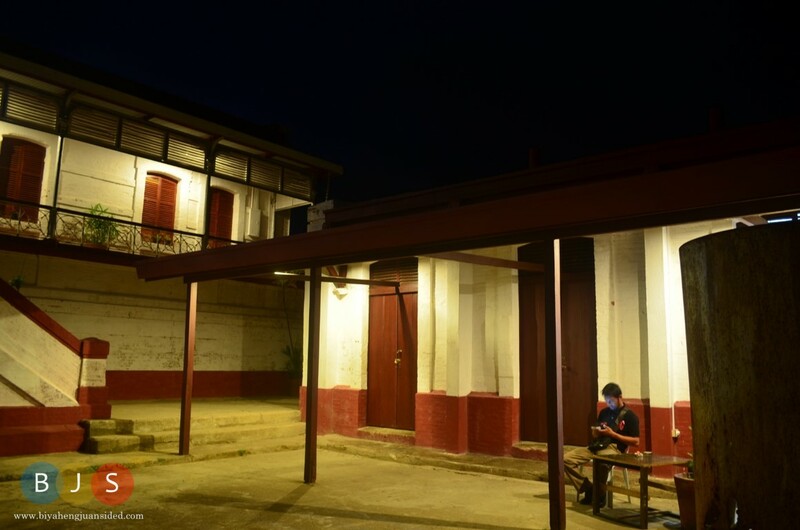 One of the major industries in the Ilocos region is tobacco. You could buy rolled dried tobacco leaves in most souvenir shops. 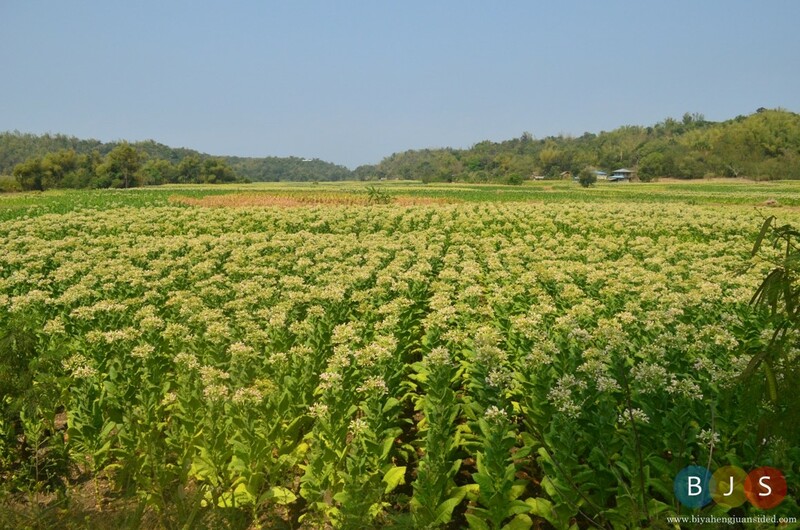 Although I don’t recommend smoking to anyone, and buying tobacco products, I find the tobaccoplantation quite attractive, especially when the plants are in bloom. 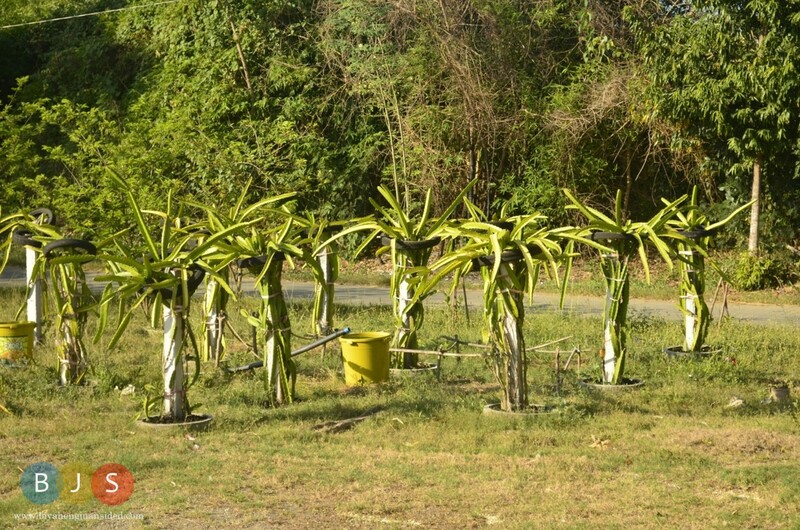 If you are interested to see the plantations, you need not to travel extra mile for it. Along the main road of Ilocos Norte, you could see a number of plantations already. 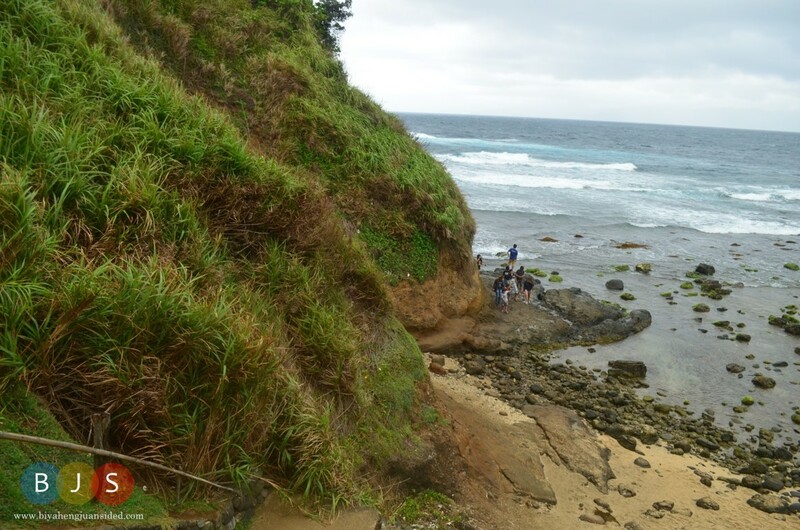 I took the photo above near the boundary between Ilocos Sur and Ilocos Norte. Before the trip, I actually never heard about this amazing chapel. From the tobacco plantation near the boundary between Ilocos Sur and Norte, you have to pass through the rough road going to Badoc. The chapel houses the “miraculous” statue of the Blessed Virgin Mary, which, according to the locals, was from Japan. The design of the chapel was based on the inverted design of a ship, which was believed to have brought the statue. 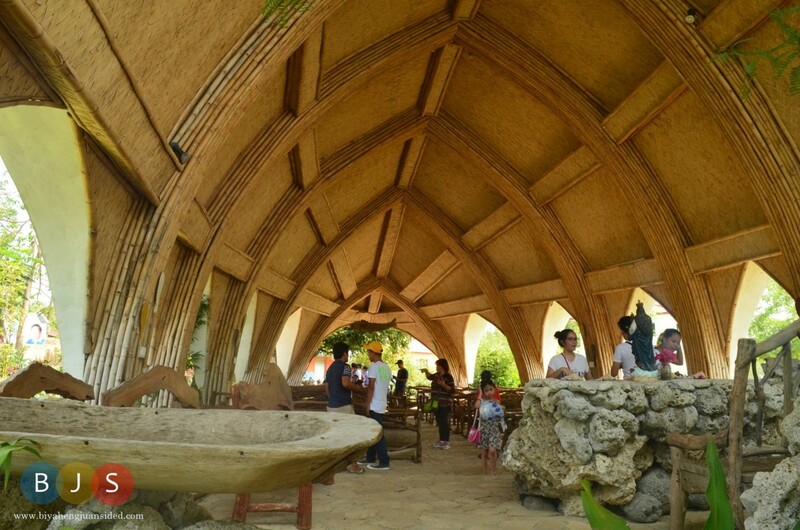 The chapel was a project of the provincial engineering office in 2013. 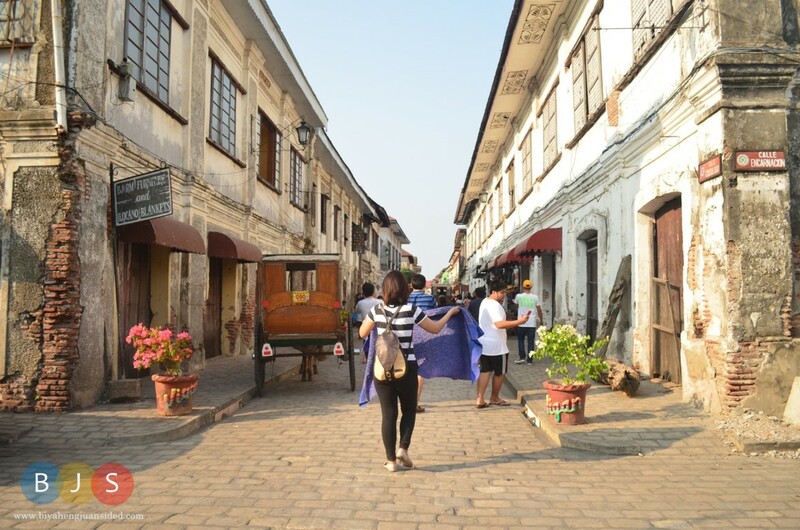 The heritage houses of Vigan is one of the most famous tourist destinations, not just in the province, but as well as in the whole country. 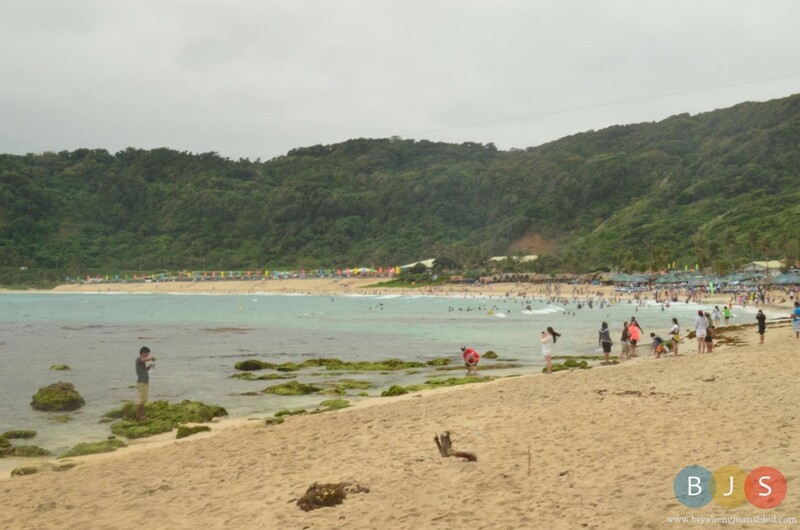 It was awarded as UNESCO’s Best Practice in World Heritage Management during the 40th Anniversary of the World Heritage Convention in Kyoto, Japan in 2012, and in 2014, it was recognized as one of the New Seven Wonders-Cities of the World. 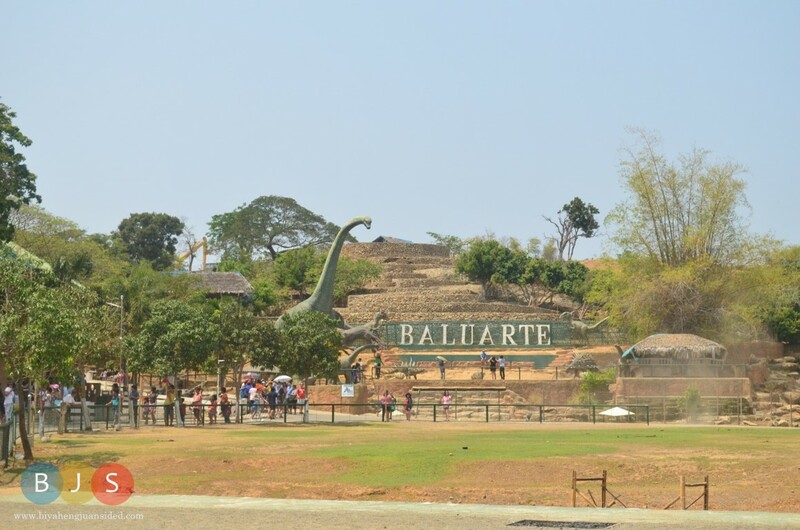 Baluarte is owned by the business tycoon and former Governor Chavit Singson. 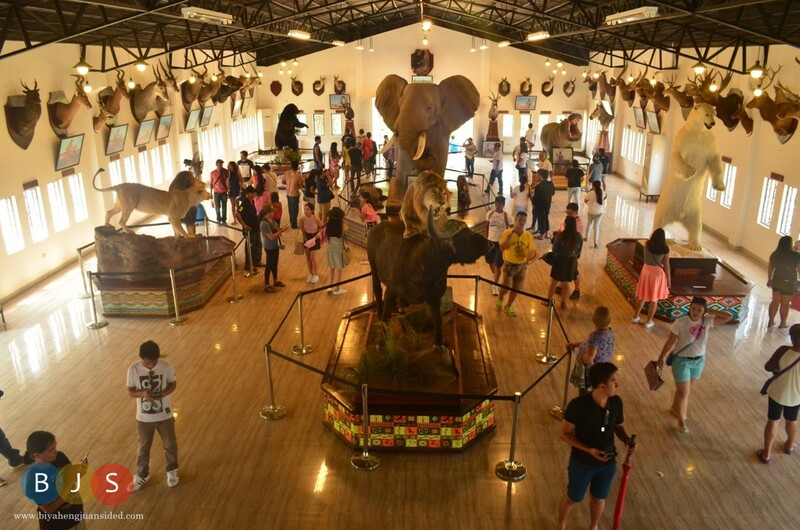 You can enter the place for free but it is still best to bring money as you may want to have your pictures taken with some live animals (including Tigers!). 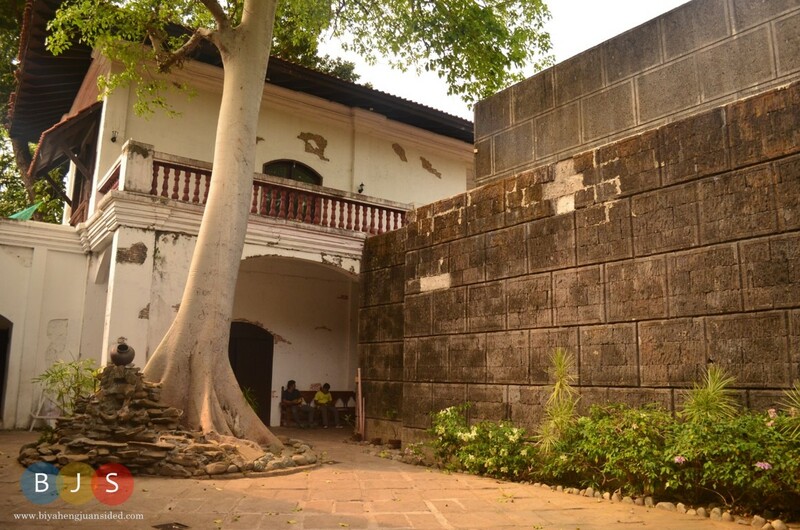 Hidden Garden is a restaurant located near the heritage houses of Vigan City. 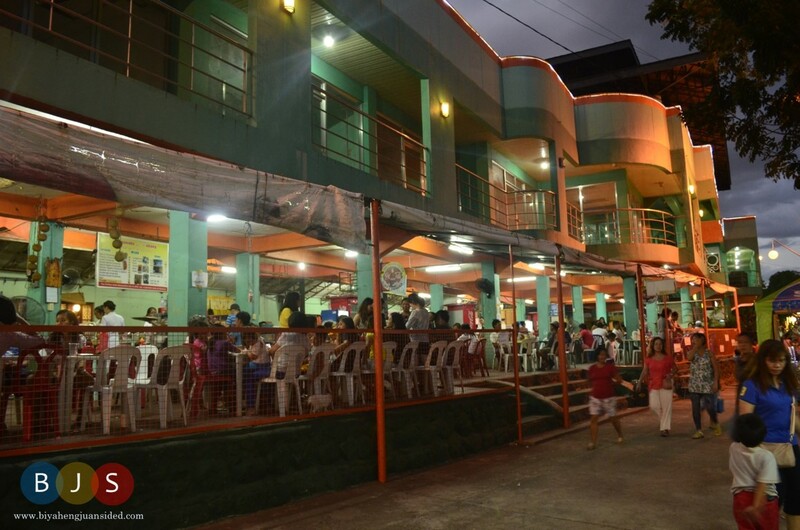 Filipino foods, especially some Ilocos prides, are served in the restaurant. As it is a garden, the whole place is packed with a wide range of beautiful plants and pots, which visitors could buy. 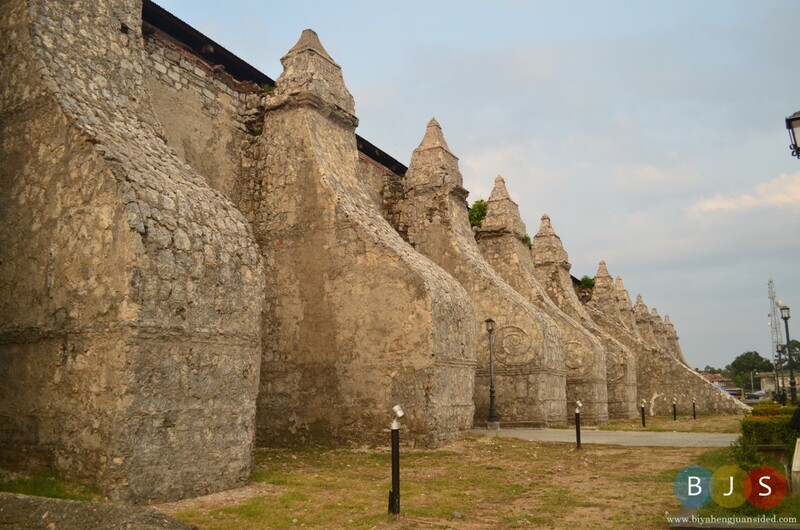 This is located just few minutes away from the heritage houses of Vigan City. 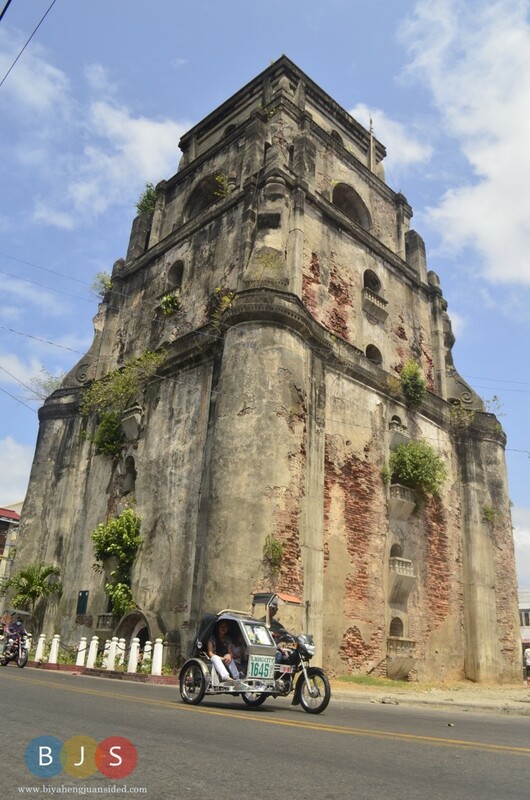 Just like in Paoay Church, the bell tower is detached from the church. 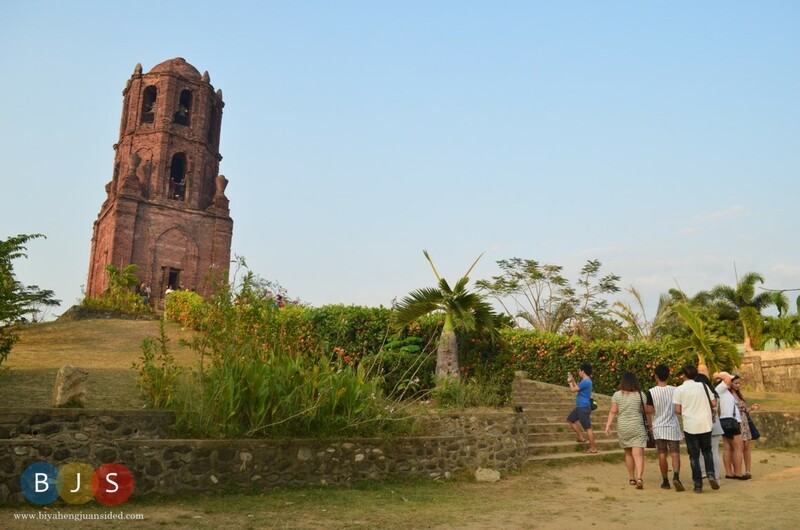 It was built on a nearby hill, which made it a very ideal watchtower, hence its name (Bantay means “to guard or to guard” in the Filipino language). The city’s plaza is packed with a number of picturesque structures. It has fountains, and life-sized statues. within the plaza, the tobacco monopoly monument stands. 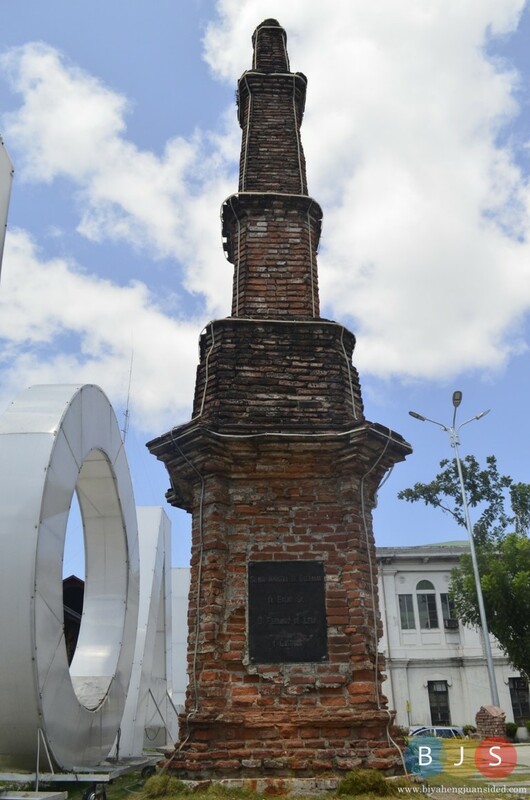 This monument serves as a commemoration of the lifting of the country’s tobacco monopoly in 1881, which ended the suffering of many Ilocanos, who were forced to work in the tobacco plantations. 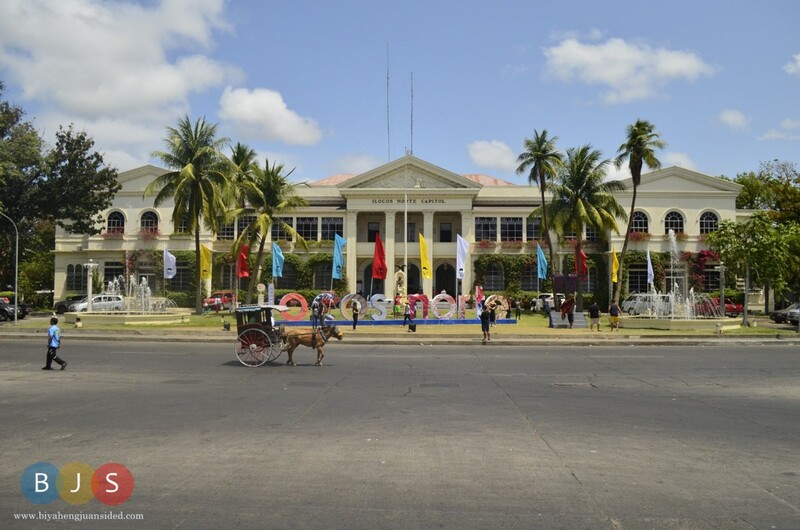 Opposite the plaza is the provincial hall of Ilocos Norte. The bell tower is called as such because, according to locals, it is indeed sinking. Few decades ago, as per the locals’ story, horse carriages used to passed through the bell tower, but as you can see in the photo, even a 5-year old person should lower himself in order for him to enter the old door. Since I love local wines, I made sure that I would be able to buy the sweet sugarcane wine of Ilocos Norte, which is locally known as Basi. Before the trip, I was only thinking of buying it from the local stores, but upon arriving in Laoag City, my friend told me that we could actually visit the winery. There are a lot of sugarcane wineries in Laoag, located near the international airport and the Northwestern University. Aside from basi, you could also buy other sugarcane products such as vinegar and basi de alak, which I think is a kind of vodka. 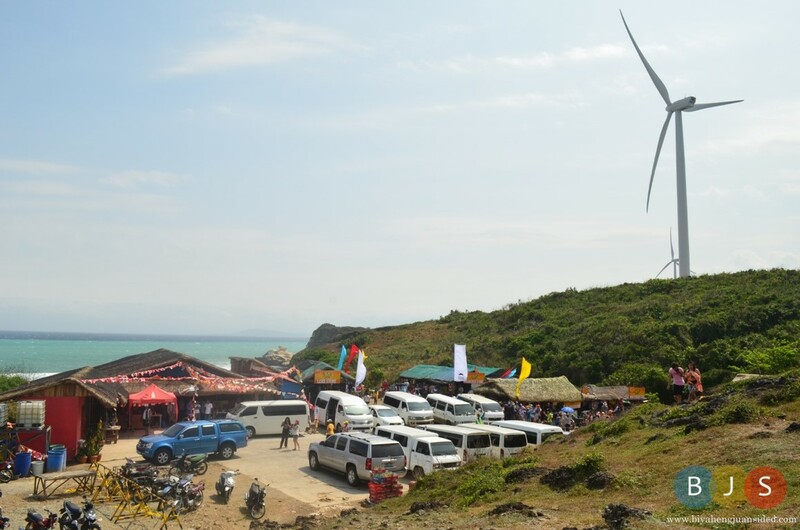 The most famous windfarm in the country is Bangui Windmills, located in Ilocos Norte. 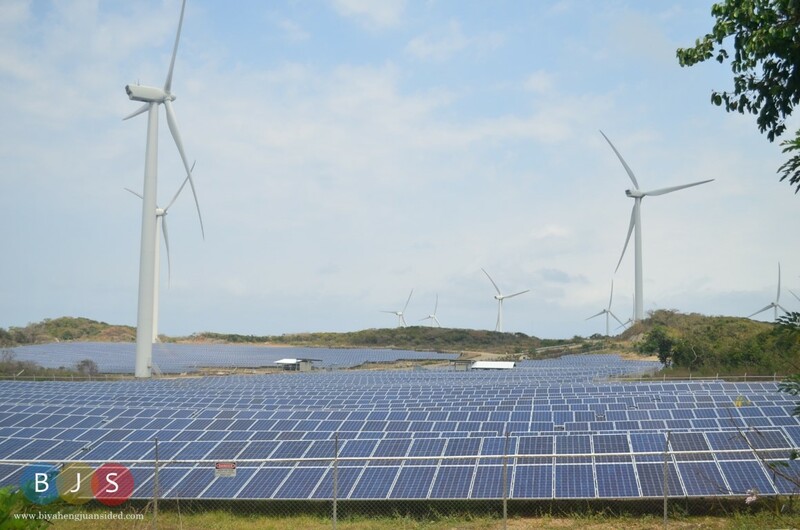 However, it is not the only windfarm in the province. 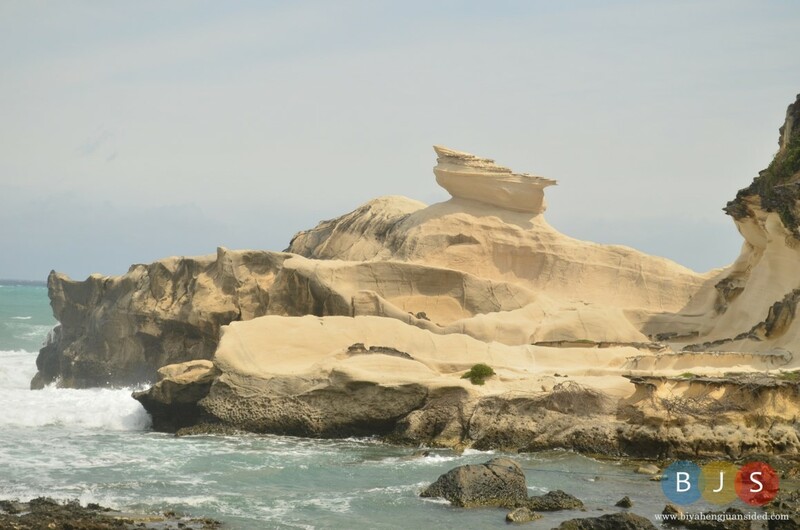 During my visit, the family of my friend brought me the municipality of Burgos where we could find its vast windfarm and the a rock formation of Kapurpurawan. 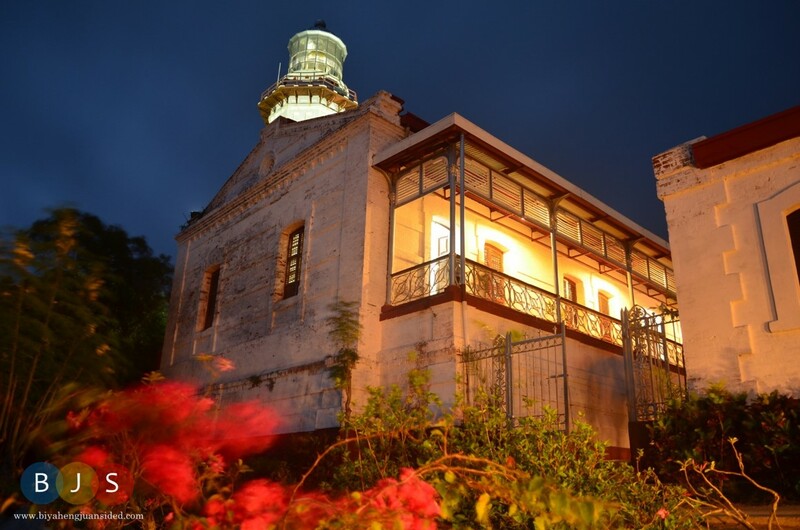 As I am a fan of old structures, particularly old lighthouses, the highlight of my trip to Ilocos Norte was our visit to Cape Bojeador Lighthouse in Burgos. 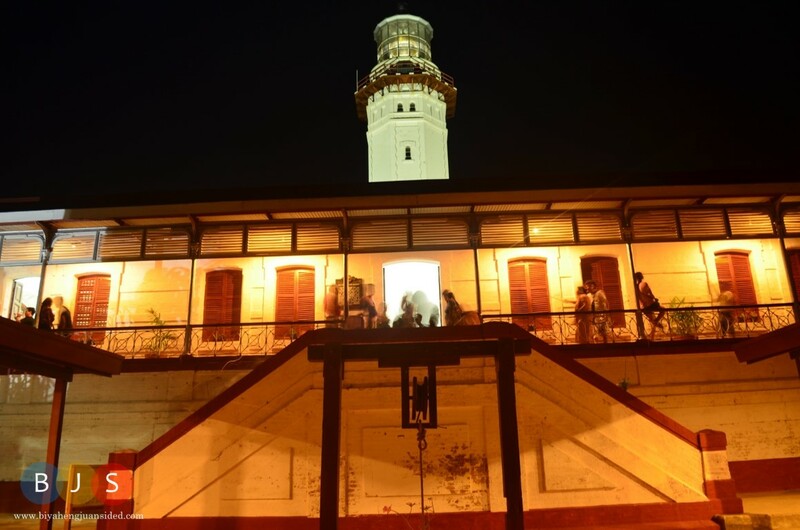 It is situated on top of the hill called Vigia de Nagparitan, and serves as a guide to ships going to Babuyan Channel, Pacific Coast, and the ports of Salomangue and Currimao (as written in the poster inside the lighthouse). Although the lighthouse is already over 100 years, it is still functional up to this day. 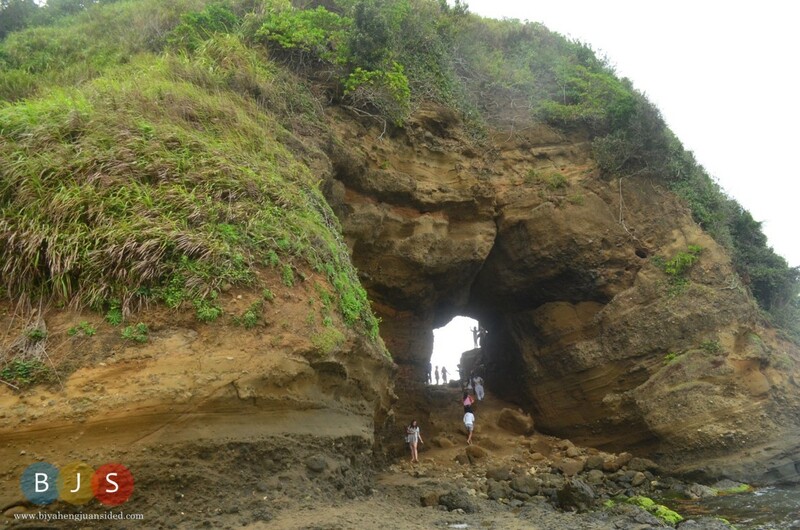 Tourists may choose to visit this magnificent structure either during the day or in the evening, as we did. 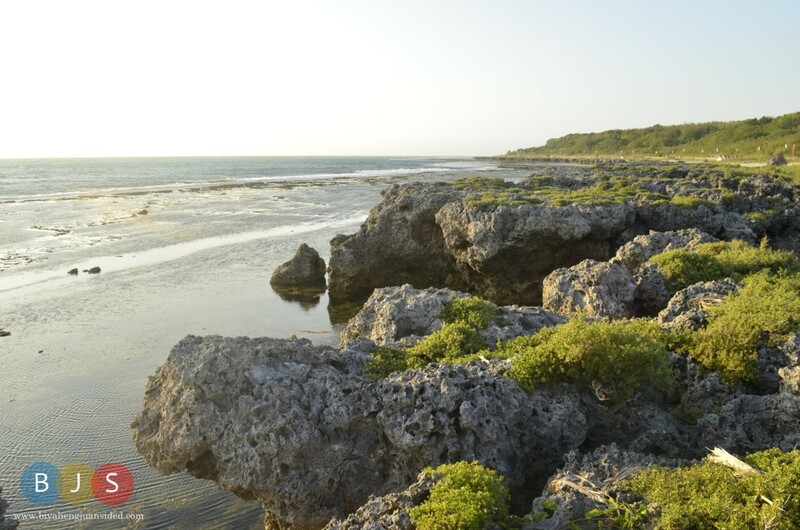 Cape Bojeador lighthouse is very near from the Burgos windfarm. I was not really sure who Anton was and why the place was called as his paradise. The are was basically a shrine with mini waterfalls along its both sides. 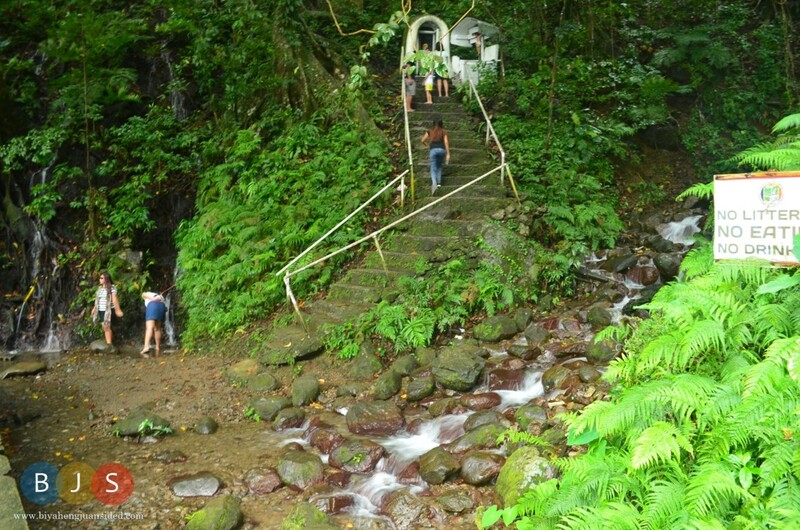 According to some people, the water flowing from these waterfalls is miraculous., thus, a number of tourists drink its water when they visit the shrine. 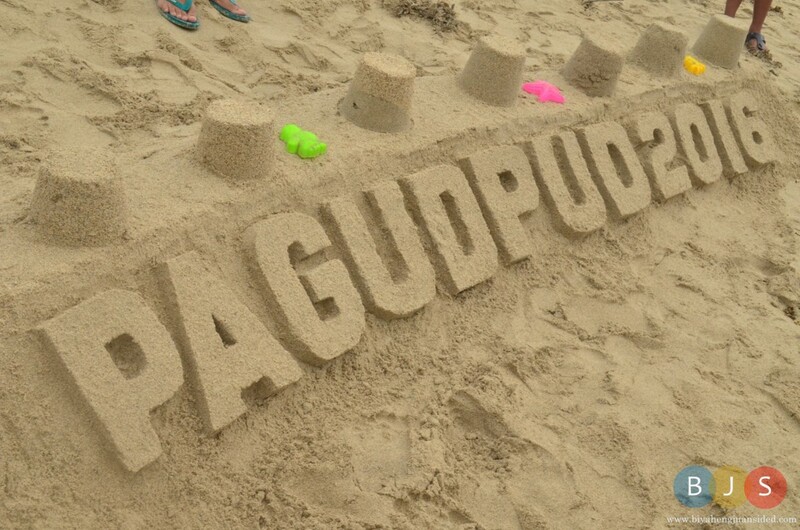 If you are planning to visit Pagudpud, this shrine is a good side trip. 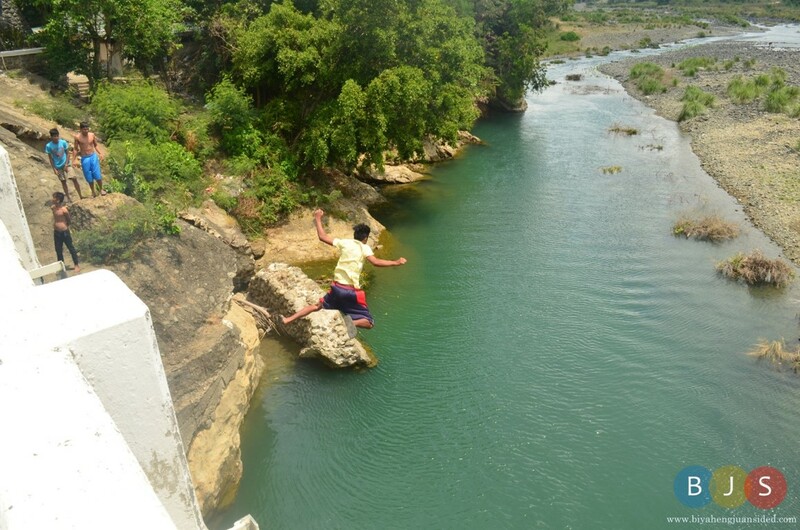 It is located at the end of Patapat Viaduct. 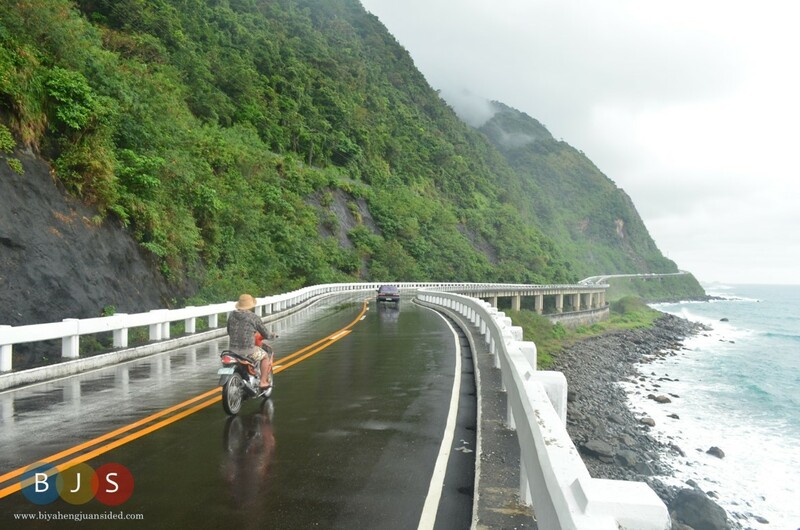 Patapat viaduct is one of the legacy projects of the Former President Marcos. It is a long (over a kilometer in length), winding road in the northernmost part of the province. It is basically like a bridge, as it is elevated. 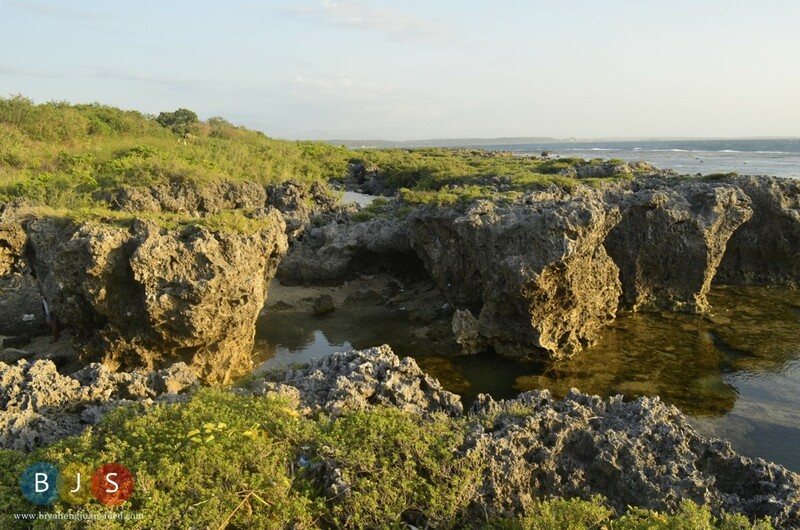 It is now one of the tourist attractions in the province, where visitors can enjoy the breathtaking view of Pasaleng Bay. 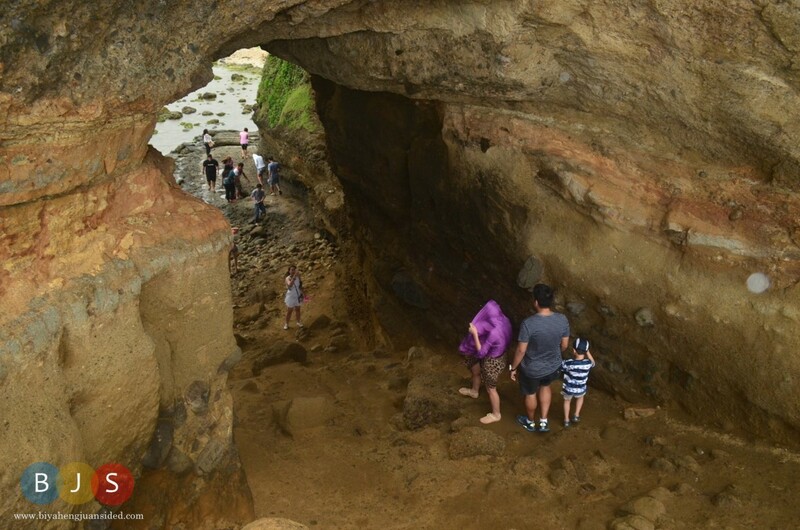 The name of the cave is a combination of two Ilocano words: bantay, which means mountain, and abot or abut, which means hole. 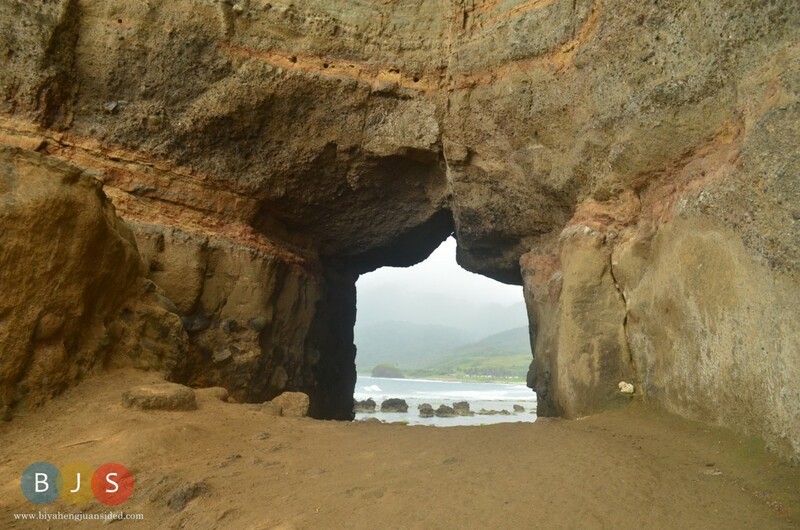 Another amazing group of rock formations located in the region is in the Municipality of Currimao. Currimao is located near Paoay. Observe courtesy to all the visitors in all the places that you will visit to avoid having conflicts with them. If travelling by group, it is best to rent the van so you will be able to comfortably travel (and faster) around the two provinces. 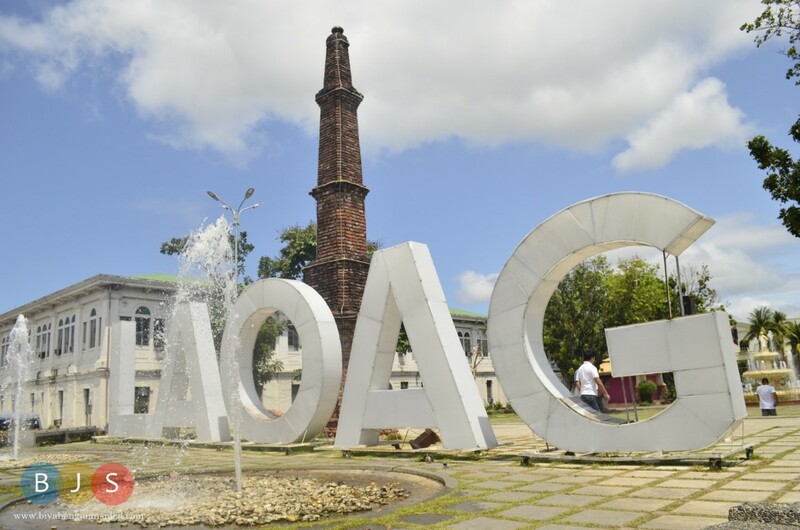 The places in Laoag mentioned in this blog post are very near to each other, so you may just walk from one of these destinations to another. 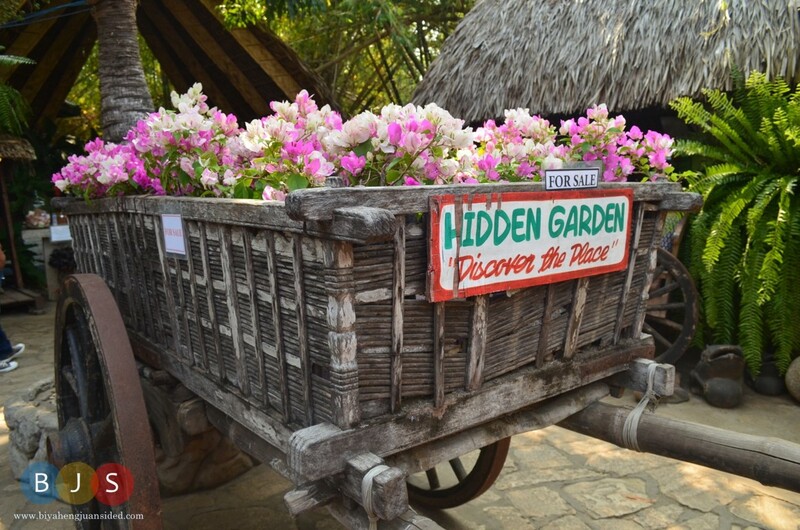 If you want to visit Hidden Garden, you may discover the place through their website. You may visit it by going to this link. 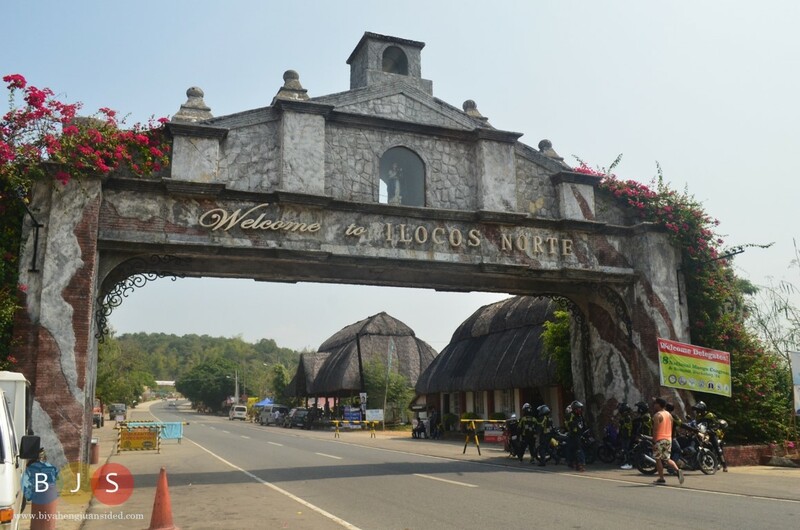 For those who are planning visit Ilocos Norte, you may check the available hotels in TravelbookPh website by clicking this link. I would like to send my sincerest gratitude to my friends Dr. Marc Jim Mariano and Mr. Stoix Nebin Pascua, and to their families, for accommodating and hosting me during this entire trip.